With over a billion people around we have very few international stars in the Sports Arena. 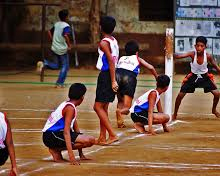 ThisismyIndia.com aims at bringing sports closer to the people by introducing various sports activities with details on how to pursue a career in sports. India - known for its fanaticism for cricket and hockey; started its sports odyssey long back during the great Vedic Era of India. Initially, the development of sports (games) in India gathered momentum after its important role, in maintaining the physical health, was coined by the people of India. Hunting, swimming, boating, archery, horse riding, wrestling and fishing mark the stage of infancy of Indian Sports (Games). Then came the Martial Arts which was also a strong way of self defence apart from a vigorous physical exercise. In India, sports (games) is seen as 'a way of realizing the body potential to its fullest'; also known as "Dehvada" in ancient India. The philosophical foundation of the sports (games) in India lies in the history of India dating back to Vedic Era in which the Atharva Veda said: ," Duty is in my right hand and the fruits of victory in my left". These words in the traditional mantra hold the same spirit as that of the Olympic oath that implies: ".......For the Honour of my Country and the Glory of Sport." The history of India also beckons of an interesting link between Greece (The Motherland of Sports in the world) and India which dates back to 975 B.C. when both the nations pioneered in the sports (games) like chariot racing and wrestling. The golden history of sports in India is also evident in the immortal Indian epics like Ramayana, Mahabharata etc. Whereas during the period of Ramayana; hunting, archery, horse riding, swimming were the royal games; Mahabharata made a mark in the sports like dicing, gymnastics, wrestling, chess (Shatranj) and gulli danda. Puranas mention about the threatening game of rope fighting. The archeological excavations of Harappa and Mohanjodaro along with the religious manuscripts like Puranas and Vedas are the standing testimonials of this glorious history of Indian sports. The historians believe that many sports (games) like hockey, archery, wrestling and chess originated in India, which are synonymous to strength and speed nowadays. In the late Vedic Era, besides sports; the Yoga and Meditation, the inevitable parts of the toughest "Yogashastra" made India, acquire the seat of spiritualism, all over the world. This dignified discipline of Indian Sports finds its place in Bhagwat Gita too. Today sports in India have achieved a zenith in terms of popularity and as a career option. Olympics, Commonwealth Games, Asian Games, SAF Games, Wimbledon and many other world sports tournaments see Indians as one of the most leading sports participants in the world. From Tendulkar, Paes, Bhupathi, Anand, Geet Sethi, Karthikeyan to Sania Mirza lead the present sports generation of India. Cricket, Hockey, Football, Weightlifting, Snooker, Kabaddi, Kho Kho and Archery are the sports of India that have been deep seated into an Indian psyche, whether of a sports person or a sports lover. Not only physical strength, power and satisfaction but also a strong alternative of recreation; sports in India have paved a long way towards the road of success and have made themselves a hallmark in the world of sports. London, April 23 (IANS) Chelsea, who started their match against Burnley with a chance to climb to third place in the Premier League, could manage only a 2-2 draw and they remain in the thick of a four-club scramble for the last two Champion League berths. View More..
New Delhi, April 22 (IANS) Even as Suthirta Mukherjee, Madhurika Patkar and Archana Kamath qualified to join Manika Batra in the main draw of the ITTF World Championships on Monday, Anthony Amalraj and Manav Thakkar were just a match away from making the cut at the Budapest event. View More..
New Delhi, April 22 (IANS) J-League side Yokohama F Marinos' sport director Doru Isac, who had applied for the post of All India Football Federation's (AIFF) Technical Director, failed to appear for an interview at the AIFF headquarters in New Delhi, on Monday, as he remained struck at the Delhi airport because of visa problems. View More..
New Delhi, April 22 (IANS) Rani Rampal, Indian women's hockey captain, believes the women hockey scenario has changed in the recent past and the interest being shown by the new generation will further help in development of the game in the country. View More..